I have very fond memories of Kirby’s Dream Land. Not only was it one of the first games I ever played, but it was one of the first that I was able to complete from title to credits. For younger games, especially those who were gaming during the NES era, this was a major feat due to the difficulty level of most other games of that time. Typically, younger or newer gamers played a game until they either got a game over, got stuck, or just got tired of playing. 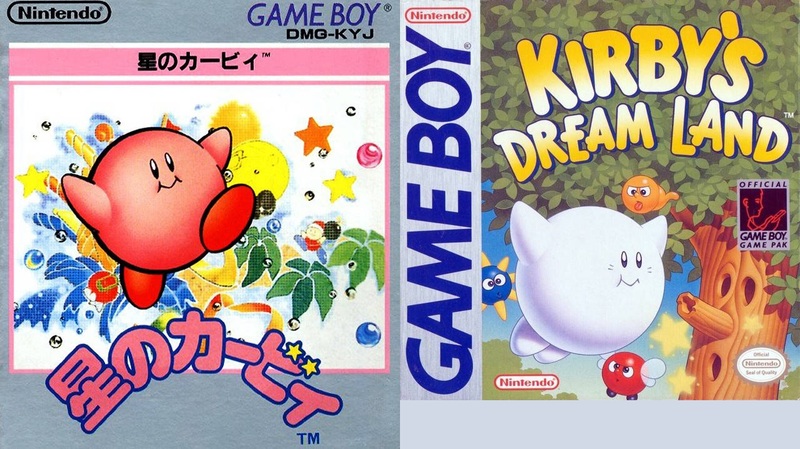 Kirby’s Dream Land stood out because it served as a perfect entry point for young gamers, allowing them to play through a full game, master a simple gameplay style, and earn that sense of accomplishment upon completion. Kirby’s Dream Land marks the first appearance of our favorite pink puffball and has paved the way for numerous sequels and new adventures in the Kirby series. While we have seen the evolution of characters, gameplay, and story since its release, Kirby’s humble beginnings give us a glimpse of what’s in store for our little hero. How it all begins, however, is never actually addressed in game, but rather found in the instruction manual. Fortunately, the plot is short, simple, and especially easy for youngsters to grasp. King DeDeDe and his band of thieves have stolen all the food from Dream Land and taken it to his castle. Not only that, he also stole the sparkling stars, which the people use for harvesting. Kirby volunteers to recover the food and stars from Mt DeDeDe and save Dream Land from going hungry. It’s nothing too outstanding, but it’s more than enough to introduce a story that never overwhelms its audience, both mentally and emotionally. In terms of tone, the game throughout is lighthearted, cute, and never grim. Charming sprites, mildly aggressive villains, and nothing too scary all serve to maintain a tone of trouble, but not too much trouble. It’s all pretty simple; journey along and wipe out everything in your path in adorable fashion. Enemies start out harmless, but become more dangerous as their numbers, positioning, and movements improve. Yet, with names like Mumbies, Scarfy, Squishy, and Booler, the threat is never intimidating. With a little practice, young gamers can definitely get a sense that it’s wholly possible to actually play this to completion. Plus, since gameplay follows the simplicity of the story, that lighthearted, upbeat feeling is ever present. 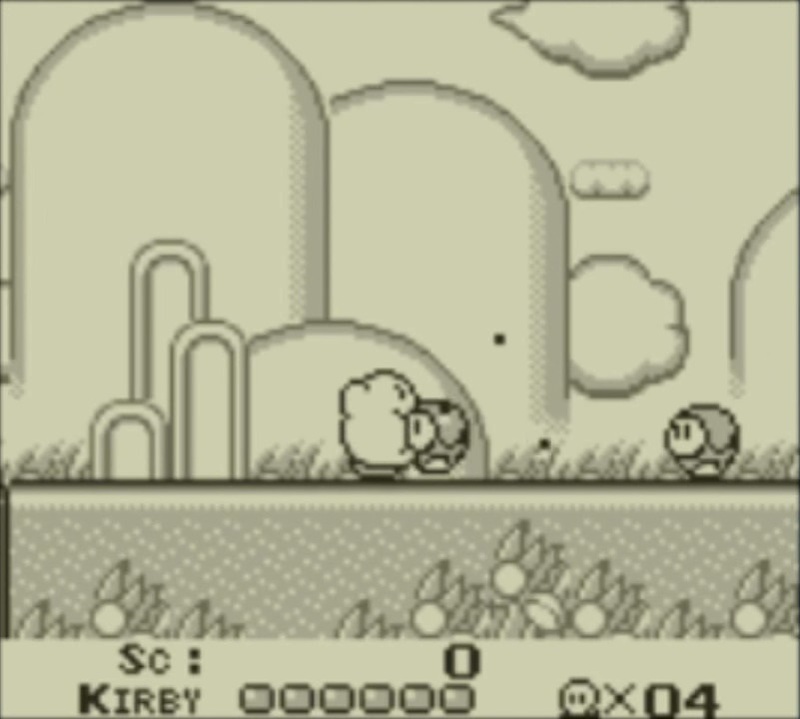 The devs of Kirby’s Dream Land utilized a popular style of gameplay common during the early 90’s, in which the ultimate goal was to get from one end of a level to the other. What determined the success of a game like this was the gameplay that occurred during that trek. Kirby stood out from others of this traditional level-by-level progression with its unique gameplay. 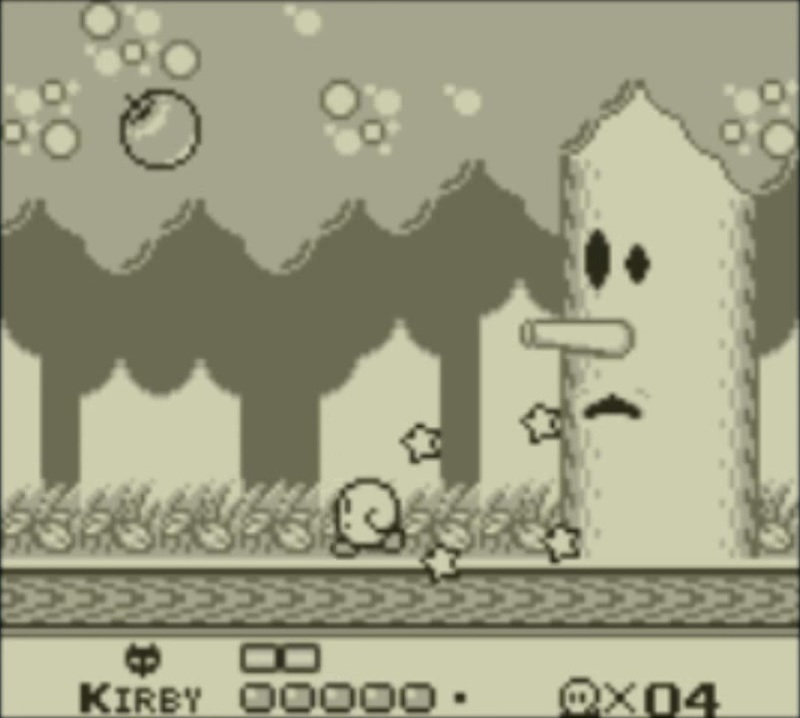 Instead of just the run and jump platforming style that oversaturated both the NES and Game Boy, Kirby utilizes his now trademark inhale-and-launch style of attack. The simplicity of approaching an enemy, inhaling it, and spitting it out at another enemy has become one of Kirby’s staple characteristics. Another defining attribute of Kirby’s is his unique ability to fly. 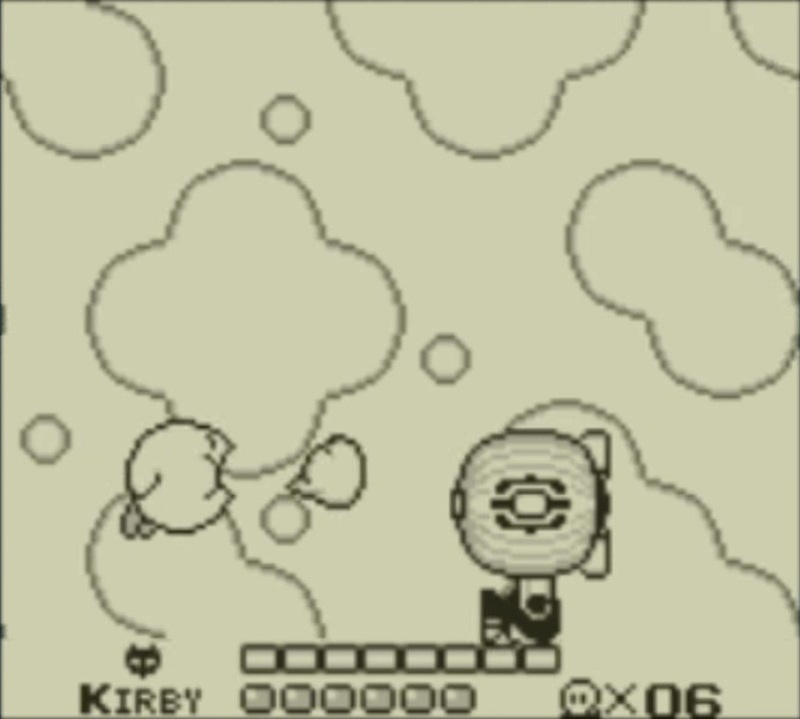 Flying lets Kirby dodge over ground enemies, but also allows him to fire a puff of air at airborne enemies. So, if enemies are too high for Kirby to jump for, he can just fly and fire. Flying also adds a challenge later in game, when maneuvering through airborne hazards becomes necessary. This was quite a new concept for platformers, since most other games grounded players, so taking advantage of an open, aerial space here was rather innovative. There were also extra special moments when Kirby would find a Spicy Food or a Mint Leaf item, allowing Kirby to launch fireballs or more powerful puffs of air. It added just enough variation to gameplay that those moments stand out and are very much looked forward to on subsequent playthroughs. Also, these two items served as precursors to Kirby’s future ability to copy enemy attacks and launch his own barrages using their abilities. Finally, if you successfully complete the game, there is an extra mode that features new, more powerful enemies, an increase in enemy numbers, and new boss attack patterns, all of which create a far more challenging experience. Along with tone and gameplay, the aesthetics of Kirby’s Dream Land are equally simplistic and full of charm. Level designs show off the peacefulness of Dream Land, despite its recent troubles. Traveling through forests, castles, water, and sky shows off the diverse landscapes Kirby will journey through. Sprites are numerous and clever, from simple birds and sheep, to classics like Whispy Woods and Kracko, the one-eyed spiked cloud. While some may look intimidating, none are a tremendous challenge, but more notable, they all seem to fit particularly well in their game world, despite their vastly varied appearances. The audio is equally appealing, as the soundtracks are cheery and upbeat in tempo. The Float Islands and Bubbly Clouds themes are pleasant and convey a laidback feel. 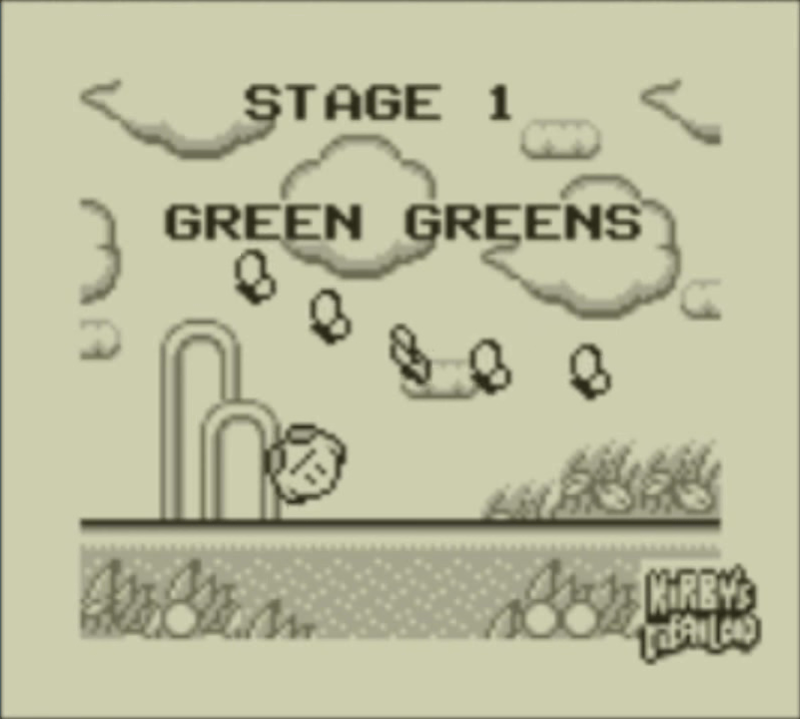 The Green Greens theme is especially chirpy in its rhythm, as it introduces gamers to Kirby’s world for the first time and has now become a classic theme in its own right. The boss and DeDeDe themes are appropriately faster and more intense to signify the importance of the ensuing battles. Even though there are fewer than ten tracks total, what is there is delightfully fitting. The aesthetics here are befitting to the game’s overall feel and I personally enjoy looking back on how this rendition of Dream Land’s sights and sounds have influenced later games. Kirby’s Dream Land is an excellent first game for new gamers and notably appropriate for a younger audience. Veteran gamers may think it’s too easy or too short, but this and other Kirby games have always been the perfect entry point for new, young gamers unable to handle the difficulty level of games meant for more mature players. Remember, this game debuted during an era known for a higher, sometimes brutal, difficulty level, so I dearly appreciate what this game can offer to new generations. Kirby’s Dream Land was a breath of fresh air and today still serves as a perfect way to introduce newcomers to gaming.